This mimosa sherbet is a dessert version of a favorite brunch cocktail. Creamy sherbet is flavored with orange juice and champagne and swirled with strawberries and vanilla cookies. Combine milk and 1/4 cup of sugar in a saucepan, and heat over medium-low heat, until just barely boiling. Meanwhile, whisk together egg yolks, pinch of salt, and the other 1/4 cup of sugar in a large bowl (you can also use a hand mixer). Beat until it looks light and creamy. When milk is barely boiling, slowly pour the milk/sugar mixture into the egg/sugar mixture, about 1/2 cup at a time, until all incorporated. Whisk continuously. Once everything is combined, pour everything back into saucepan and stir frequently over low heat until mixture is thick enough to stick to the back of a wooden spoon. Once thickened, pour mixture into a large plastic bag set in a bowl of ice water. Replenish ice to keep the water chilled, and/or place bowl in the refrigerator to chill quicker. Once the mixture is chilled, open bag and stir in vanilla extract, orange juice, champagne and stir. 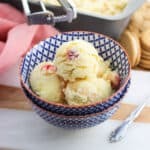 Pour the mixture into ice cream maker, and prepare according to your ice cream maker's instructions, adding strawberries and cookie pieces when instructed. The sorbet will be soft once it's done, so transfer to a separate container and stick back in the freezer to harden to your preferred firmness. Prep time includes an estimate for chilling.